Mother Nature smiles on some cities more than others. Phoenix, obviously, is blessed in the sunshine department. 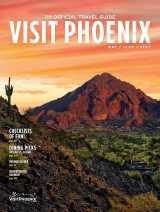 While autumn descends across most of the country in September, sunny summer days linger in Phoenix. Come October, the days are warm, pleasant and perfect for outdoor fun while cool nights lend themselves to dining al fresco. Phoenix skies stay blue throughout winter with high temperatures in the 60s and 70s. Desert nights and mornings can get chilly, but the temperature rarely drops below freezing. Phoenix&apos;s springtime weather is consistently perfect with blooming cacti and wildflowers brightening our desert. Daytime temperatures loll around 80 degrees while evenings are comfortably cool. Hey, it’s hot. The old axiom is that “it’s a dry heat,” and there’s truth to that. The Sonoran Desert’s super-low humidity means 90-degree temperatures (32 degrees C) feel quite nice, and the arid climate causes perspiration to evaporate quickly, keeping you cooler and drier.